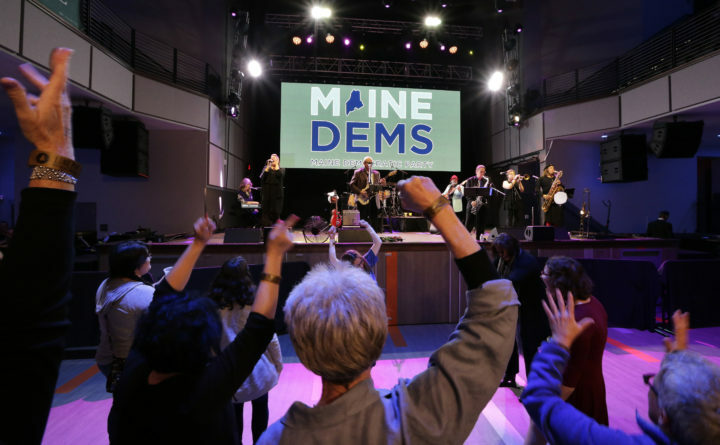 People dance at a Maine Democratic party on election night, Tuesday, Nov. 6, 2018, in Portland, Maine. On Sunday, the Maine Democratic State Committee elected a former York County party leader to head the state committee for the next two years. Kathleen Marra had been endorsed by Gov. Janet Mills and had previously served as the chairwoman of the Kittery Democratic Committee, vice chairwoman of the York County Democratic Committee and a member of the state committee. Marra won Sunday’s party chair election over Melissa Sterry of Augusta, who ran the campaign of Natasha Irving, a Democrat who unseated a Republican district attorney of four midcoast counties last year. Also elected on Sunday was Erik Gunderson to a two-year term as state committee vice chairman. Gunderson was unopposed. Gundersen currently serves as a policy adviser to House Speaker Sara Gideon, D-Freeport, and has spent the last eight years working for Maine House Democrats in various capacities. Marra and Gundersen replace outgoing Chairman Phil Bartlett and Vice Chairwoman Peggy Schaffer, respectively. Prior to the committee elections, Mills circulated a letter to the committee members, saying she’s “most familiar” with Marra and saying she would be “a well-organized and thoughtful leader” for the Democrats.